Diamonds are formed when extreme heat (temperatures of 2200 degrees Fahrenheit) and extreme pressure cause carbon atoms to crystallize forming diamonds approximately ninety miles under the earth's surface. Diamonds reach the surface of the earth via volcanic channels. Diamonds are deposited on the surface of the earth when a volcano erupts. Diamonds are the hardest of all known bodies scoring a level of 10 (harder than steel) on the Mohs Hardness Scale. A Diamond is a clear transparent precious gem stone made totally of Carbon atoms (Chemical Composition 'C') crystallised in a cubic (isometric) arrangement which has been highly compressed over millions of years. A diamond can also be described as a transparent crystal of tetrahedral shaped bonded carbon atoms. A tetrahedron is composed of four triangular faces, three of which meet at each vertex. The tetrahedral arrangement of atoms is the source of many of diamond’s properties. A crystal structure is composed of a unit cell which is a set of atoms arranged in a particular way. These are periodically repeated in three dimensions on a lattice. The spacing between unit cells is called the lattice parameters. Diamonds are a natural product which usually present the form of crystals. The crystals are more or less regular and perfect in their development. These forms of crystals belong to the group of geometrical solids known to crystallographers as the Cubic or Isometric system. 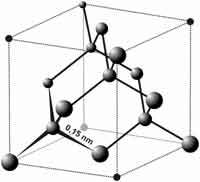 The unit cell of diamond has a two atom basis in which half of the atoms are at lattice points. Diamond crystal structures and symmetry play a role in determining many of its properties including cleavage, electronic band structure and optical properties. The most common forms of diamond structures are the regular octahedron and the rhombic dodecahedron ; the former bounded by eight equilateral triangles, and the latter by twelve rhomb's, or lozenge-shaped surfaces or structures. The faces of the crystals are often more or less curved, or convex structures, whilst those of other crystalline bodies, with few exceptions, are flat structures. Diamonds commonly take the form of a six-faced octahedron, which, by the rounding of its eight-and-forty faces becomes almost spherical or approaches a small ball in structure. The Carbon Element exists freely as graphite and diamond and is obtained from burning with insufficient oxygen. As previously stated the tetrahedral arrangement of atoms is the source of many of diamond’s properties. However the carbon atoms in Graphite display a different (non- tetrahedral) connectivity and as a result shows completely different physical characteristics. Graphite is therefore very different to a diamond and is a soft, dark gray, opaque mineral. Discover some fascinating information about Crystal Structures.